The name just sounds healthy doesn’t it? One look at this salad and it screams, Eat Me, I’m good for you! 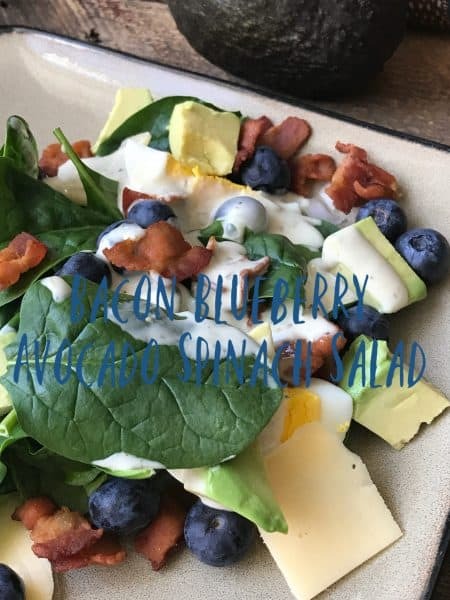 Bacon Blueberry Avocado Spinach Salad has it all. A delicious blend of flavors that will make you want to make this salad again and again. For this salad we used a smoked gouda cheese, mainly because that’s what we had on hand but feta cheese would also work nicely in this salad. 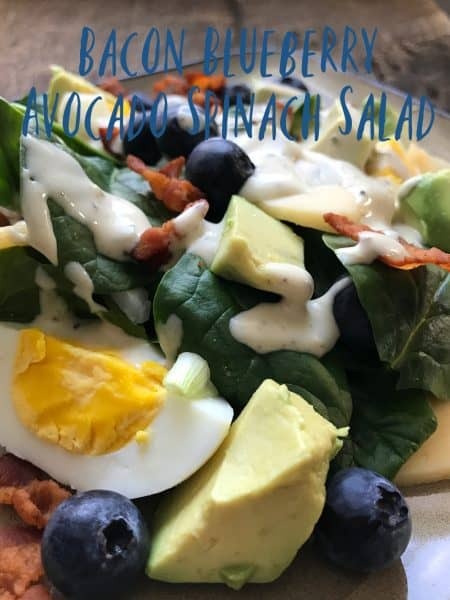 This delicious salad has one of my favorites, avocado. Though avocados are high in unsaturated fat, half of an 8-ounce avocado contains only 138 calories. In addition, avocados contain a fair amount of vitamin C, thiamine and riboflavin. Almost 80% of today’s avocado crop comes from California. The two most widely marketed avocado varieties are the almost black Hass and the green Fuerte. Round and smooth skinned, these blue-black berries are juicy and sweet. There are two main types of blueberries. High-bush variety and low-bush variety, which thrive in Canada and the northern United States. Cultivated blueberries comprise the majority of those that reach the market. Choose blueberries that are firm, uniform in size and indigo blue with a silvery frost. Discard shriveled or moldy berries. So not wash berries until ready to use. Store preferably in a single layer, in a moisture-proof container. Blueberries can be refrigerated for up to 5 days. Use blueberries in baked goods, jams, pies, pancakes, salads or serve as simple as possible. 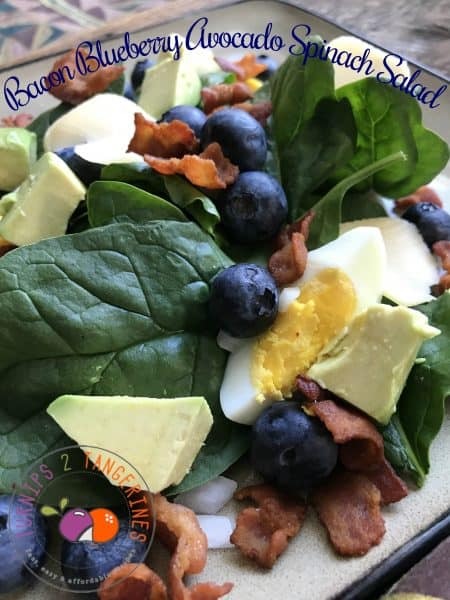 My favorite way to enjoy fresh blueberries, besides this super salad, is in a bowl with a generous drizzle of cold, heavy whipping cream. The best! Spinach [SPIHN-ihch] Popeye’s addiction to this ‘power-packed’ vegetable comes from the fact that it’s a rich source of iron as well as vitamins A and C. Spinach has dark green leaves that, depending on the variety, may be curled or smooth. Fresh spinach is available year-round. Choose leaves that are crisp and dark green with a nice fresh fragrance. Avoid those that are limp, damp or discolored. Refrigerate spinach in a plastic bag for up to 3 days. Spinach, which is usually very gritty, must be thoroughly rinsed before using. For convenience, purchase bagged spinach that’s already pre-washed. 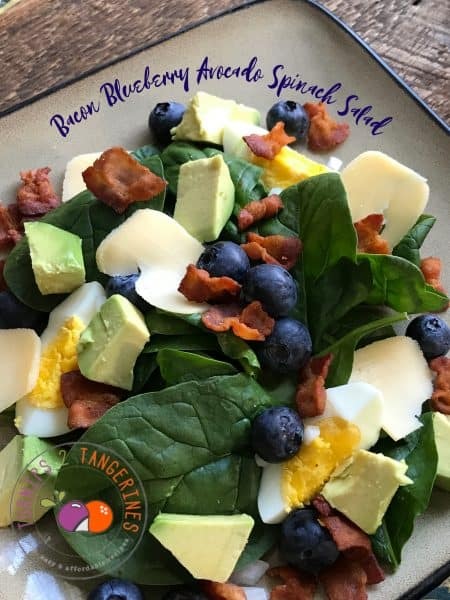 Over the last several years, due to its beneficial nutritional values and the fact it’s super low in calories, fresh spinach has made a huge comeback. Fresh spinach has become nearly as popular as bagged lettuce! Spinach is also available frozen and canned. Spinach can be used fresh in salads or cooked, usually by boiling or sautéing. It can be served as a vegetable or as part of a dish. Many dishes that use spinach as an integral ingredient are appended with the phrase À La Florentine. Frozen spinach is used in a wide variety of dishes and dips. Look through our Recipe Box to find recipes using this lefty green good for you vegetable. For this salad, we used a bottled salad dressing. You can easily make your own dressing or even a light drizzle of olive oil and lemon juice would be nice. The brand of bottled salad dressing that we use most often is Marzetti Salad Dressings. 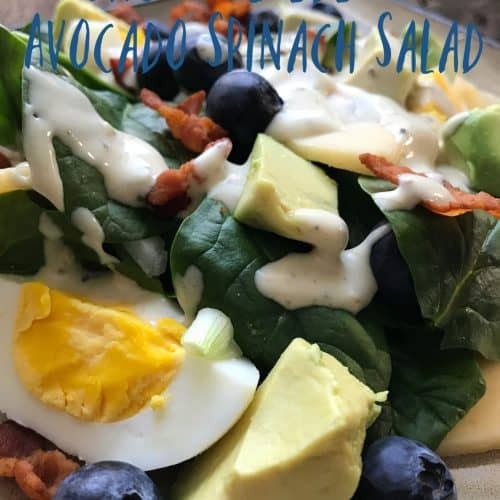 For this recipe we used our favorite, Marzetti Poppyseed Dressing But Marzetti Pomegranate Vinaigrette or Marzetti Fat-free Raspberry Vinaigrette would be awesome too. A delicious and good for you sensational salad. In a small skillet fry bacon until crisp. Remove bacon with slotted spoon and drain on paper towel lined plate. Set aside. Divide spinach leaves between 4 serving plates or bowls. Divide blueberries, diced onion, eggs and cheese between serving plates. Top each plate with crisp bacon. Slice avocado in half lengthwise. Twist slightly to separate. With a sharp knife, stab avocado pit and remove. Discard pit. Carefully peel off outer shell from avocado halves. Dice avocado. Divide between serving plates. Serve salad with poppy seed salad dressing or salad dressing of your choice. 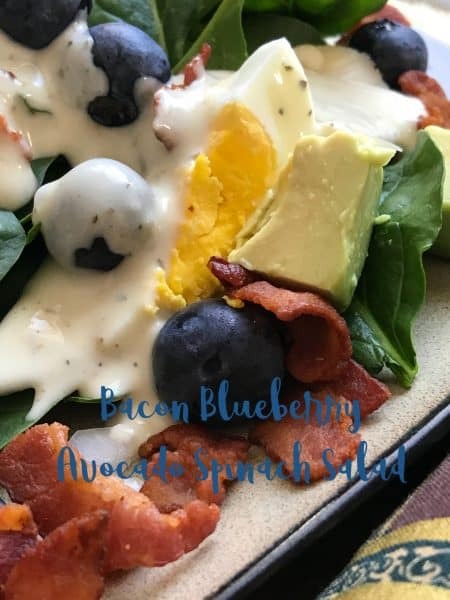 Bacon Blueberry Avocado Spinach Salad is super delicious that’s true but why not try this recipe for Bacon Blueberry Scones. Blueberries and bacon are meant for each other. Don’t think so? Give either of these recipes a try and find out for yourself. It’s a match made in culinary heaven.